With more Americans who have little or no medical insurance, many have turned to their credit cards to pay off costly medical bills. That’s not the best alternative, though – at least, not at first. No one wants their credit ratings to suffer because of overwhelming medical bills, but you certainly don’t want to max out your credit cards because it’s your only financial option. Here are a few things you should be sure to cover well before you whip out the plastic to pay for surgeries, doctors visits or even prescriptions. It’s no longer the health and medical industry’s well kept secret that it charges the uninsured far more than those who are insured. It has everything to do with the insurance companies negotiating lower rates for their policy holders. While that sounds great for those who do have insurance, it’s those who do not who must pay whatever the hospitals or physicians demand. That said, there’s a very real possibility that you can negotiate lower rates. It’s not uncommon for some to be able to reduce the amount owed by 20% or more. It won’t be a suggestion made to you, however. You’ll have to be the one to bring it up. There are many different studies, and while the numbers will vary slightly, it’s believed as many as 20% of all itemized medical bills have charges that are inaccurate. This is important since most patients never check those itemized bills; in fact, they never even request them. If you’re strapped for cash and use your credit cards to pay these bills, there’s a good chance you’re not only paying for charges that shouldn’t have been there in the first place, but you’re also paying interest on those inaccuracies. It’s worth an hour or two of your time to closely monitor what those charges are. It’s true many medical centers and doctors no longer allow patients to pay their balances over time; there are still those who will consider it, especially if you’re a long-time patient. It’s worth your while to ask, even if you’re told that’s not a possibility. At least you’ll know. And if turns out you can pay the balance over time, you’ll save a lot in finance charges alone by paying with cash versus credit cards. You may even be able to work out an arrangement that the hospital or other medical center will only charge a portion of your balance while agreeing to wait 30 or 60 days to charge another portion or the remaining balance. You shouldn’t agree to this unless you’re sure you’ll be able to accommodate another hit to your credit card’s available balance. Again, this is not something you want to do unless you’ve exhausted all other options. If it turns out there are no other viable options available, try to put the debt onto a credit card that has an introductory 0% APR. Choose a credit card that will allow a bit of time for you to pay down the debt without having to worry about high interest rates. Keep in mind the expiration period so that you’re focused on lowering your balance. Remember that this should be your last option. Too many times, consumers find themselves overwhelmed with credit card debt. The stress associated with that is good for no one’s health. 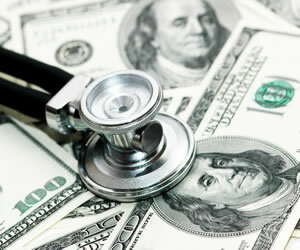 It may mean defining a new budget, but your goal is to pay those medical bills off as quickly as possible. Don’t put it off, though. Once you have a solid game plan, you’re going to find it easier to move forward without the weight of a financial burden resting on your shoulders. Budget carefully and then act on it. Bottom line, your health and that of your family’s is your top priority. Many people will turn to their savings or for bigger medical emergencies, they make the difficult decision to tap into their retirement plans. Ideally, the health care crisis in this country will be remedied in the near future rather than the distant future. With more employers no longer offering health care insurance as part of its employment package, it very well could be the recent setbacks are just the tip of the iceberg.